Over recent years, a peptide found in soy called lunasin has been receiving a lot of attention. It has become the subject of extensive research especially into its effects on cancer, inflammation and heart disease. Lunasin is a bioactive peptide derived from soy and also present in wheat, oats, rye and barley. Lunasin is composed of 43 amino acids and is among the most promising peptide when it comes to its health benefits. A number of studies have found that lunasin has anti-inflammatory, antioxidant and anti-cancer potential while studies into its ability to regulate cholesterol are ongoing. Apart from its availability in soy products and other grains, lunasin is now sold as an ingredient in capsules and protein drinks branded as Lunasin XP and LunaRich by Soy Labs. These products promote lunasin for reducing cholesterol, cancer prevention and reducing inflammation. People in South East Asia consume far more soy than their Western counterparts. Soybean is one of the oldest crops grown in the Far East. It has been consumed in Asia as a major protein source for thousands of years. According to research, Asians consume between 20 and 80 grams of soy a day while the average American consumes just 1 to 3 grams each day. A number of epidemiological studies have hypothesized that the lower incidence of certain cancers among Asian people are a result of the intake of soy products and the consumption of soy isoflavones. (1) (2) Nevertheless, these epidemiological studies have not identified the precise constituents in soy responsible for the anti-cancer effects. Studies into the effects of lunasin have been focused mainly on cancer, inflammation and heart health. While the studies are still in their early stages, the signs seem good especially when it comes to the anti-cancer and anti-inflammatory potential of the peptide. With that in mind, researchers have begun to study the effects of lunasin on cancer to examine whether the peptide is responsible for the apparent anti-cancer effects of soy. Studies have found that lunasin remains bioactive after oral consumption. It is well absorbed by the bloodstream and can reach the target organs or tissue in a stable state. This is an important factor in the treatment of disease. Inflammation is at the heart of a wide range of diseases including heart disease, rheumatism, diabetes and dementia. It has also been linked to the development of cancer and an increased risk of malignancy and tumor progression. The same university of Illinois team that examined the effects of lunasin on cancer also performed a second study to examine the effects of the peptide on inflammation. This was the first study to report on the anti-inflammatory potential of lunasin. According to lead researcher Elvira de Mejia, increasing your intake of soy protein rich in lunasin can have a major effect on the reduction of chronic inflammation. According to de maija, future studies should help them to provide dietary recommendations. Manufacturers of lunasin enriched products claim that they help reduce cholesterol and help boost cardiovascular health. When it comes to the effects of soy on cholesterol levels, evidence is mixed. At present, the FDA allows manufacturers to claim that consuming 25 grams each day of soy protein as part of low fat and low cholesterol diet can help reduce a person’s risk of developing heart disease. However, because of the inconsistent findings, the FDA has considered revoking the claim. According to the manufacturers of LunaRich XP, taking a single 125 mg capsule will provide the same amount of lunasin as 25 grams of dietary soy protein. 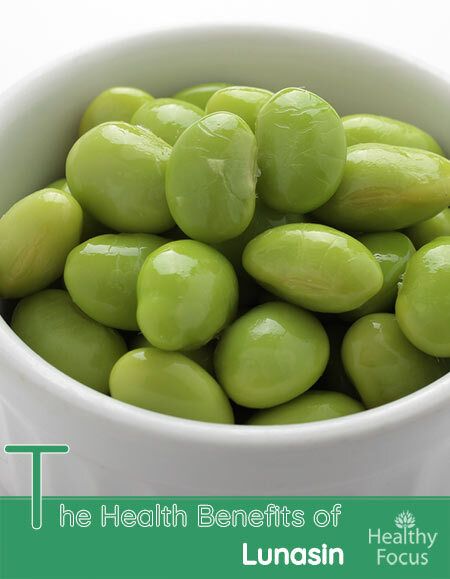 They have also claimed lunasin is the component of soy protein which is responsible for lowering cholesterol. ALS is an incurable disease which affects the motor neurons in the spinal cord causing progressive atrophy of the muscles. In 2014, a news program reported that a man suffering from ALS had experienced incredible improvements in speech, limb strength and swallowing after taking a supplement regime including lunasin. These improvements were confirmed prompting a clinical trial into the potential effects of lunasin on ALS. Fifty people suffering from ALS were given the same lunasin extract for a year and the results analyzed in September 2017. Unfortunately, the researchers concluded that lunasin had no effect on the progress of the disease. Consumption of lunasin also resulted in a number of adverse side effects including constipation bad enough to require hosp[ital treatment. (15) The researchers concluded that there must have been some other explanation for the man’s improvements such as genetic resistance. When taken in dietary form, lunasin is likely safe although some people with allergy to soy should avoid consuming it. Side effects are possible in people who take large doses of lunasin. Various adverse side effects have been reported including severe constipation, getting full quickly and weight loss. If you are allergic to soy, you should avoid taking lunasin supplements as well as any dietary soy products. A number of soy powder mixes and drinks that contain lunasin also contain soy isoflavones. These have an estrogenic effect and aren’t recommended for women who are pregnant or breast feeding. Women with breast cancer should also avoid using these products. Lunasin is a peptide found in soy protein and also present in various grains like rye, wheat, oats and barley. It is available in supplementary capsule and powder form. Studies have found that lunasin is well-absorbed by the bloodstram and remains bioavailable when it reaches the target tissues and organs. Various studies have demonstrated that lunasin has anti-cancer potential as well as anti-inflammatory actions that can reduce the risk of disease. Lunasin may help reduce cholesterol levels but according to the most recent clinical study, it has no effect. the jury is still out however and future studies may focus on larger doses. People with soy allergies, regnant women and women who are breast feeding should avoid using lunasin as should women with breast cancer.